My last blog featured autumn trees, and as it’s such a good time to be working on trees I’ll follow it up with summer trees which can be adapted for autumn trees if necessary. Woodlands are great places at this time of year when the autumn mists create fascinating, soft backgrounds. Even in sharp visibility I tend to make woodland backgrounds less harsh as it adds a sense of mystery and simplifies the composition. This is part of a painting of a beechwood and you will see that I’ve given a different treatment to each of the three main tree-trunks. The right-hand tree was painted in while the background was still damp, and this included the foliage as well as the trunk. The soft, cool colour suggests distance. When the paper was dry I painted in the middle tree-trunk onto dry paper. The sharper edges tend to bring it closer, yet there is still no detail on the trunk. Finally the closest tree has been made larger and with strong detail and dark tones, thus really bringing it forward. I’ve also made use of the dead leaves of the previous winter lying on the ground, to enhance the warm foreground and hence push the rest of the scene into the distance. The complete painting can be seen at Erwood Station Craft Centre, with several others. I shall be demonstrating there on Saturday 23rd November from 2pm to 4pm, on how to rescue watercolours that have not quite worked, and how to improve parts of a painting with which you may not be happy with. The cost of the demo is £7 which will be donated to the Welsh Air Ambulance. Erwood Station lies beside the beautiful River Wye, about 8 miles south of Builth Wells, and is a lovely place to explore, stop for tea and refreshments and walk some of the footpaths. At the moment Erwood bridge is closed, so you either need to approach the centre from the north via the B4567, or if coming from the south cross the Wye at Boughrood bridge and drive northwards with the Wye on your left. Ring 01982 560674 for information. 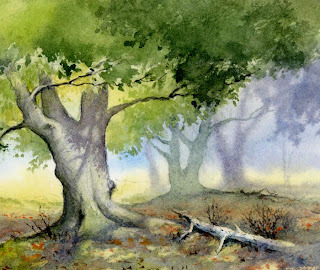 This entry was posted in aerial recession in landscape paintings, atmosphere, David Bellamy by David Bellamy. Bookmark the permalink. David, I have always admired your watercolor painting landscapes; may you send me more examples on my email?